The Theater Workshops showcase student actors ages 8-18 and teach them to shine! These workshops afford budding young performers the opportunity to experience many aspects of play production. 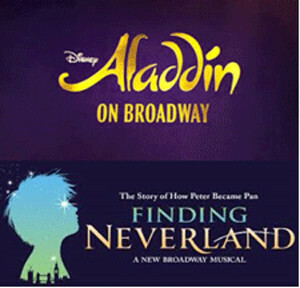 They will learn vocal technique, movement, character development and scene study – with an amazing trip to New York City to see the Broadway Musical, ALADDIN or FINDING NEVERLAND, including a “Broadway Classroom” workshop and lunch at Planet Hollywood or Bubba Gump before the show! All sessions conclude on a Friday with a student performance based on Broadway musicals. Chaperones, guests and extended family members may register for the field trip only! Wednesday July 8th or 29th to see FINDING NEVERLAND or Wednesday July 22nd to see ALADDIN, Including transportation, one ticket to show, enrollment in Broadway Classroom and lunch at Planet Hollywood or Bubba Gump. Subject to availability after workshop students have been registered. I just want to tell you that I am all new to weblog and certainly savored you’re website. More than likely I’m going to bookmark your blog . You amazingly come with remarkable article content. Appreciate it for revealing your webpage. my little girl treasures contentment and also technique any 360 frontal https://www.youtube.com/watch?v=ny8rUpI_98I. far? I amazed with the analysis you made to make this actual post amazing. customize it your self? Either way stay up the nice quality writing, it is uncommon to peer a nice blog like this one these days..
hello there and thank you for your info – I have certainly picked up anything new from right here. I did however expertise some technical issues using this web site, as I experienced to reload the site lots of times previous to I could get it to load correctly. I had been wondering if your web host is OK? Not that I am complaining, but slow loading instances times will very frequently affect your placement in google and can damage your high-quality score if ads and marketing with Adwords. Anyway I’m adding this RSS to my email and can look out for a lot more of your respective interesting content. Make sure you update this again very soon..
You could certainly see your skills within the work you write. The world hopes for even more passionate writers like you who aren’t afraid to mention how they believe. All the time go after your heart. work and coverage! Keep up the superb works guys I’ve incorporated you guys to my blogroll. It is the best time to make some plans for the future and it’s time to be happy. I’ve read this post and if I could I want to suggest you some interesting things or tips. Perhaps you can write next articles referring to this article. I desire to read more things about it! fantastic put up, very informative. I wonder why the opposite specialists of this sector don’t understand this. You should proceed your writing. I’m sure, you’ve a huge readers’ base already! Hello, Neat post. There is a problem along with your website in web explorer, might test this¡K IE nonetheless is the market leader and a good portion of people will leave out your excellent writing because of this problem. of course like your website however you have to test the spelling on several of your posts. Several of them are rife with spelling issues and I to find it very troublesome to tell the truth then again I¡¦ll surely come again again. hello!,I really like your writing so a lot! proportion we communicate more about your article on AOL? I need a specialist on this area to solve my problem. May be that’s you! Looking forward to look you. Great website. A lot of helpful information here. I¡¦m sending it to a few pals ans also sharing in delicious. And certainly, thanks for your effort! Wow, amazing weblog format! How lengthy have you been blogging for? you make running a blog glance easy. The overall look of your site is great, as well as the content material! Great goods from you, man. I have understand your stuff previous to and you are just extremely great. I really like what you’ve acquired here, certainly like what you’re stating and the way in which you say it. You make it entertaining and you still take care of to keep it smart. I can’t wait to read far more from you. This is really a wonderful web site. I simply wanted to type a brief note to be able to thank you for all of the amazing ideas you are writing at this website. My time intensive internet search has at the end of the day been honored with awesome concept to write about with my friends. I would tell you that many of us site visitors are unquestionably blessed to exist in a useful network with very many special individuals with beneficial guidelines. I feel extremely lucky to have used the weblog and look forward to really more brilliant moments reading here. Thanks a lot once again for everything. I have been browsing online more than 3 hours today, yet I by no means found any attention-grabbing article like yours. It is beautiful worth sufficient for me. In my opinion, if all website owners and bloggers made good content material as you probably did, the web shall be much more helpful than ever before. Thank you for another excellent article. The place else may anyone get that kind of info in such a perfect way of writing? I have a presentation next week, and I’m on the search for such info. I enjoy you because of all of the efforts on this website. My daughter delights in engaging in internet research and it’s really easy to see why. Almost all notice all of the powerful ways you create reliable things by means of the website and as well encourage response from other people on that point so our own child is always starting to learn a great deal. Have fun with the remaining portion of the new year. You’re the one performing a useful job. I have to show my appreciation to the writer just for rescuing me from this particular crisis. Right after looking through the world wide web and coming across things that were not helpful, I believed my entire life was over. Living minus the approaches to the difficulties you’ve sorted out by means of your report is a crucial case, and ones that might have negatively affected my career if I hadn’t come across your web page. Your actual ability and kindness in taking care of all the details was very helpful. I am not sure what I would’ve done if I hadn’t encountered such a solution like this. I can also at this time look ahead to my future. Thanks for your time very much for the skilled and amazing guide. I won’t hesitate to suggest your web sites to anyone who would like tips on this situation. I was just seeking this info for some time. After six hours of continuous Googleing, finally I got it in your site. I wonder what is the lack of Google strategy that do not rank this kind of informative sites in top of the list. Generally the top websites are full of garbage. I together with my friends have been taking note of the nice tips and hints located on your web page and then immediately came up with an awful feeling I had not expressed respect to the blog owner for those tips. All the guys became for that reason stimulated to learn them and already have certainly been using them. Many thanks for genuinely well thoughtful and for deciding upon this kind of nice issues most people are really needing to learn about. My honest apologies for not expressing gratitude to you sooner. I am not sure where you’re getting your information, but great topic. I needs to spend some time learning more or working out more. Thank you for fantastic information I used to be on the lookout for this information for my mission. whoah this blog is wonderful i really like reading your articles. Keep up the great paintings! You realize, a lot of people are looking around for this info, you can aid them greatly. hi!,I love your writing very much! proportion we keep up a correspondence extra approximately your post on AOL? I need a specialist on this area to unravel my problem. May be that is you! Looking ahead to peer you. you’re in point of fact a just right webmaster. The site loading velocity is incredible. It sort of feels that you’re doing any unique trick. Also, The contents are masterpiece. you have performed a fantastic activity in this subject! You can definitely see your skills within the work you write. The arena hopes for more passionate writers like you who are not afraid to mention how they believe. All the time follow your heart. on. You’ve done an impressive task and our entire group can be grateful to you. I do believe all of the ideas you’ve presented to your post. They are really convincing and will certainly work. Still, the posts are too short for starters. Could you please prolong them a bit from next time? Thank you for the post. I have been surfing on-line greater than 3 hours these days, but I never found any interesting article like yours. I’m still learning from you, as I’m improving myself. I absolutely liked reading all that is posted on your blog.Keep the aarticles coming. I loved it! Its like you read my mind! You appear to know so much about this, like you wrote the book in it or something. I think that you could do with a few pics to drive the message home a little bit, but instead of that, this is magnificent blog. A great read. I will definitely be back. great. I do not know who you’re however certainly you are going to a famous blogger if you happen to are not already. I must get across my love for your kindness giving support to folks who actually need help with in this topic. Your very own commitment to passing the message up and down appeared to be exceptionally significant and has continuously helped guys much like me to reach their objectives. Your own helpful recommendations means a great deal a person like me and substantially more to my peers. Thanks a ton; from everyone of us. It is truly a great and helpful piece of info. I¡¦m happy that you shared this useful info with us. Please stay us informed like this. Thanks for sharing. Wow, marvelous blog format! How long have you been running a blog for? you make running a blog glance easy. The entire glance of your website is great, let alone the content material! Hello, Neat post. There is an issue with your site in web explorer, might check this¡K IE nonetheless is the market leader and a large component to people will miss your magnificent writing because of this problem. I do believe all the ideas you have presented for your post. They are really convincing and will definitely work. Still, the posts are very short for novices. May you please prolong them a little from next time? Thank you for the post. My wife and i have been excited when Michael could round up his research via the precious recommendations he got out of your web pages. It is now and again perplexing just to choose to be giving away helpful hints that many some people could have been making money from. And we all figure out we need the writer to give thanks to for that. Those explanations you’ve made, the easy blog navigation, the relationships you can make it easier to instill – it is mostly superb, and it is helping our son in addition to us reason why the subject matter is fun, which is certainly pretty fundamental. Many thanks for the whole thing! I¡¦ll immediately take hold of your rss feed as I can not in finding your email subscription hyperlink or e-newsletter service. Do you’ve any? Kindly let me understand in order that I may subscribe. Thanks. obviously like your website but you need to test the spelling on quite a few of your posts. Many of them are rife with spelling issues and I to find it very bothersome to inform the reality nevertheless I will certainly come again again. wonderful issues altogether, you simply won a emblem new reader. What might you suggest about your publish that you made some days in the past? Any sure? Simply wish to say your article is as astonishing. The clearness in your post is just great and i could assume you are an expert on this subject. Fine with your permission let me to grab your feed to keep up to date with forthcoming post. Thanks a million and please carry on the rewarding work. I have been browsing online greater than 3 hours lately, but I never discovered any attention-grabbing article like yours. It¡¦s pretty worth enough for me. In my opinion, if all site owners and bloggers made just right content material as you did, the net shall be a lot more helpful than ever before. I must show my thanks to the writer for bailing me out of this dilemma. Just after scouting through the internet and seeing recommendations which are not powerful, I was thinking my life was done. Being alive without the presence of answers to the issues you have fixed through your entire write-up is a crucial case, as well as those which could have badly damaged my career if I hadn’t encountered the blog. Your own ability and kindness in handling all the stuff was very helpful. I don’t know what I would have done if I had not discovered such a subject like this. I can also now look forward to my future. Thanks for your time so much for your reliable and results-oriented help. I won’t be reluctant to endorse your blog to anyone who would like recommendations on this subject. I intended to post you a very small remark to help give thanks again with your beautiful information you’ve contributed on this site. It is simply unbelievably open-handed with people like you giving easily all many people could possibly have marketed for an ebook in order to make some dough on their own, notably now that you might have tried it if you ever considered necessary. The ideas also served to be the good way to recognize that some people have a similar zeal much like mine to understand great deal more pertaining to this condition. I know there are lots of more enjoyable instances ahead for folks who examine your blog post. I not to mention my buddies came going through the excellent items on your site then at once came up with an awful feeling I had not expressed respect to the web blog owner for those tips. All of the ladies were thrilled to see all of them and have really been tapping into them. Appreciate your actually being simply thoughtful and for picking out this sort of important subject matter most people are really desperate to discover. My honest apologies for not expressing gratitude to sooner. You really make it seem really easy together with your presentation however I find this topic to be actually one thing that I believe I’d never understand. It sort of feels too complex and extremely extensive for me. I’m looking ahead for your subsequent post, I will attempt to get the grasp of it! Needed to post you a very little observation to be able to thank you so much once again with the unique basics you have featured on this page. It is certainly shockingly generous of you in giving unreservedly exactly what most people could possibly have made available for an e-book in making some money for themselves, and in particular given that you could have done it in the event you considered necessary. Those points additionally acted like a easy way to be certain that most people have the identical keenness the same as my own to grasp lots more with regards to this issue. Certainly there are thousands of more pleasurable moments in the future for people who view your website.